Genuine Sales™ builds the competence – skills and habits – that make every sales conversation count. Yet that isn’t enough to reach sales goals consistently, is it? They need more! 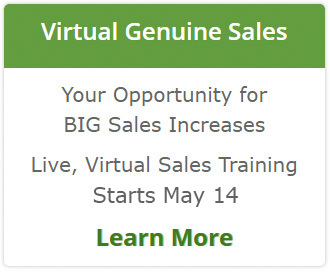 Genuine Sales builds the confidence needed to succeed in today’s demanding selling environment. Skills and competence are needed and are amplified when the confidence to act and proactively engage in as many sales conversations as possible are developed as well. The Success Drivers are “what it takes” for long-term sales success. By focusing on the competence (skills) and confidence (drivers) of selling success, Genuine Sales produces long-lasting increases in sales, engagement, and ROI. That’s the question that every seller – and company – should be asking themselves. What’s in it for this buyer? What’s in it for this prospect? What’s in it for our customers? What’s in it for Them is a mindset. It’s what drives collaboration and value to the buyer… and ultimately the seller and company. If your buyers were direct they would tell you that they want you to make buying your solution easy. They would tell you that they don’t want MORE information and useless chatter – they want sales professionals to address their problems, opportunities, wants, and needs efficiently and collaboratively. And yet most sellers aren’t sure how to make it about Them or how to collaborate. They are trained to share information on their product, service, company, and, let’s face it – on themselves! Product information dumps don’t work well… sellers need to cut through the extraneous detail and hype and focus their conversations on the relevant information for that buyer and situation. Today’s complex selling environment means that win-win outcomes aren’t enough. There are more stakeholders that need to win. 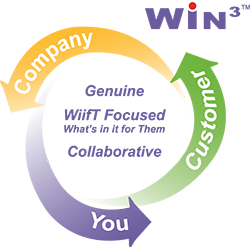 The goal for long-term success is to achieve a win-win-win, a triple win (the win-cubed) or Win3 – where the customer, your company, and seller all win time and time again. Long-term sales success habits and more closed sales is what you can expect. Sellers learn how to quickly work buyers through a collaborative, genuine, efficient, and effective sales process conversation by conversation. How Does Genuine Sales™ Do This? By strengthening the competence and confidence factors with action focused tips, techniques, and tools! Our training “sticks” to provide you a long-term ROI. Though most training “events” push a lot of information – impact is reduced because 87% of their effectiveness is lost in the first 30 days. Genuine Sales begins with a Workshop that provides great information and tools to start action producing momentum. Then accelerates the application and results over the next 7 weeks as sellers work their plan of action and collaborate with peers in weekly group sessions (teleconference or classroom) to reinforce the actions and drive accountability. These “Reinforcers” move the information into repeatable action… and the sales results follow. 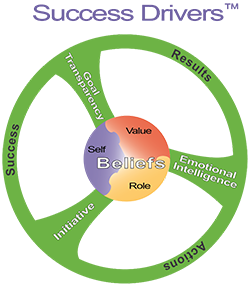 Genuine Sales provides the system, tools, and process to changes behavior and build success habits. Genuine Sales is tested and proven across many industries and countries – 22 to date! Our Genuine Sales course is a comprehensive behavior-changing course that immerses your team in the right actions and habits to sell more. The learning process generates increased sales, profits, and performance. Genuine Sales is the complete sales training solution that ensures your sellers collaborate and make each sales conversation count!